Registration is NOW OPEN! On-site registration is available at Ott's on the Green from 8am to 9:45am on March 20,2016. IMPORTANT! If you have already registered, do not forget to pick up your "goodie bag," race bib and other goodies at Ott's on the Green between 8am and 9:45am! Shuttle buses will be available to transport you to Washington Lake Park for the run if you do not wish to drive! 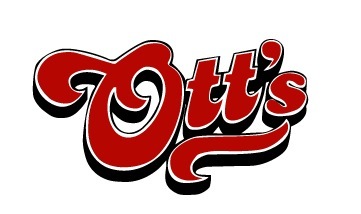 All post-race activities will take place back at Ott's where they will have food and drink specials...and don't forget your free draft beer! 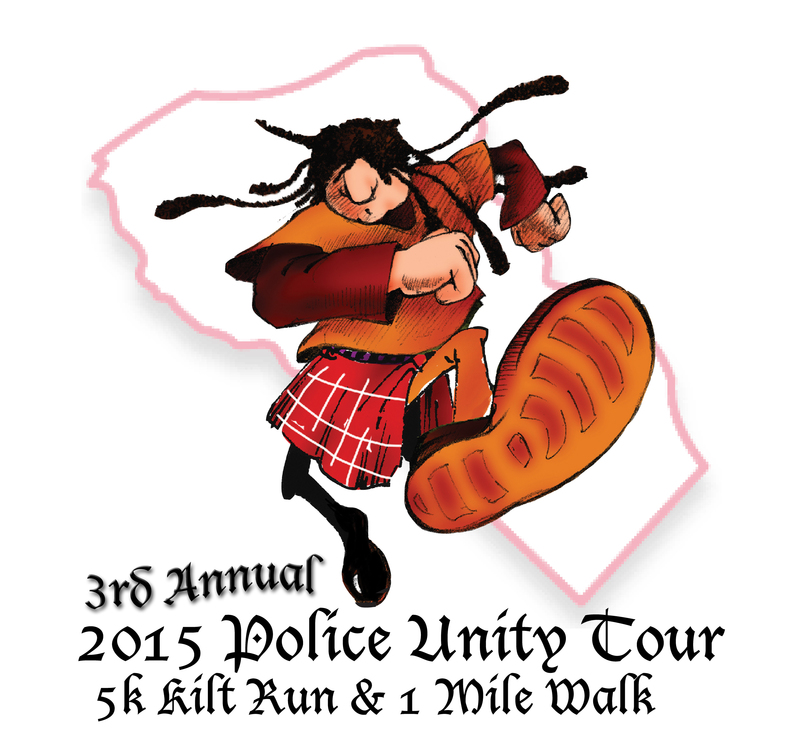 Join us for the ORIGINAL Police Unity Tour Kit Run in New Jersey! FREE BEER! You heard me right, following the run, join us for a pint of Guiness (or domestic draft) in your souviner pint glass following the run at Ott's on the Green! Not to be imitated, join hundreds of your friends dressed in traditional garb while supporting a good cause - all days before you celebrate St. Patrick's Day! 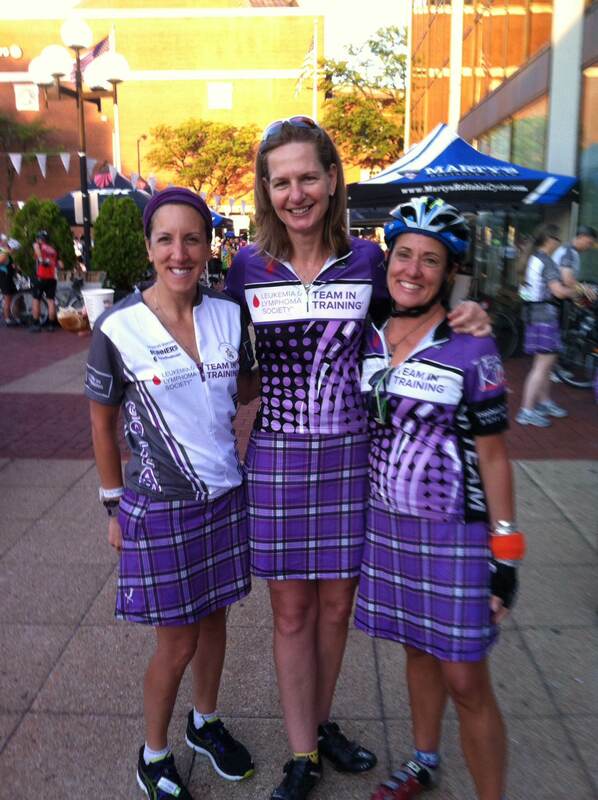 Remember, KILTS are STRONGLY encouraged! The 5K course runs through Washington Lake Park, a beautiful 400-acre park complex in Washington Twp. (Sewell), NJ. Great food before and after the race! Food and drink specials after the run at Ott's - so stay around with friends and family! Police Unity Tour merchandise will be for sale! Before you show up to the run, visit JWalkingDesigns (www.jwalkingdesigns.com) and order your kilt through our run sponsor or when you register through Active! A Kilt - worn as a show of strength and stamina with significance. A pattern and plaid unites a group of individuals who stand together - and run together - as one. 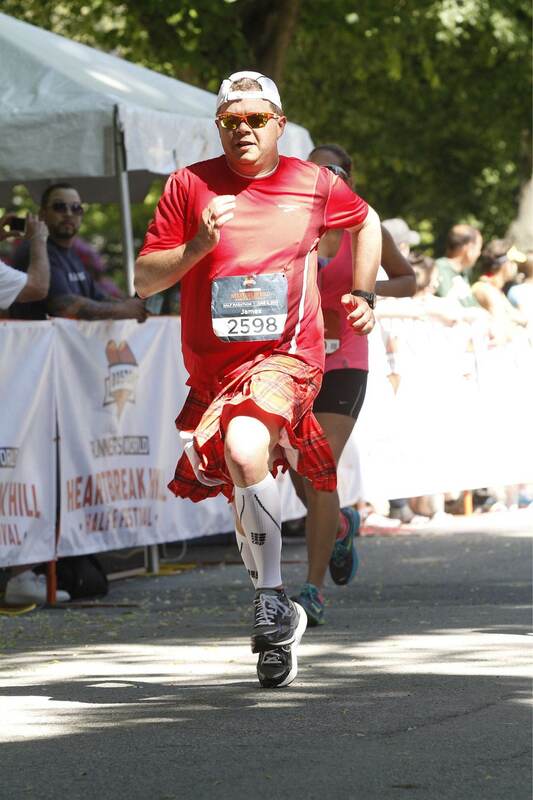 Our lightweight Running Kilts aim to make those who dare to wear comfortable. Made in the USA out of eco-friendly fabric (84% recycled plastic bottles, to keep them lightweight, and 16% Spandex to keep their shape), our Running Kilts are flexible, fashionable and washable! As a show of respect and thanks for our police, 10% of all sales through the Active.com registration will be donated to the Unity Tour from JWalkingDesigns. Prizes for top male and female individual performers, top team (average of top 3 times), individual performer in public safety, select age categories, top 1 mile Kid Run and best dressed award. Kilts are available for purchase! (Sport Kilts with elastic waist which is better to run in!) 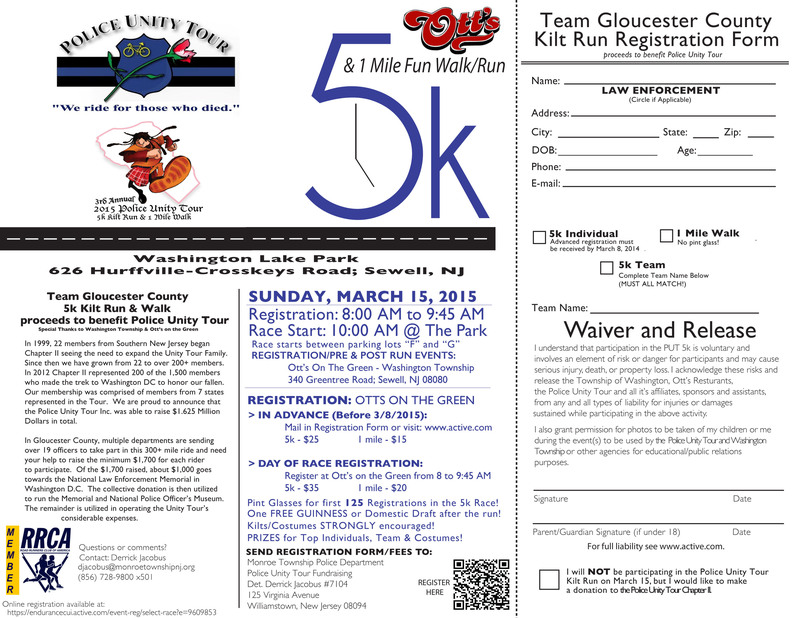 - contact race organizers at 856-728-9800 x501 or contact the event director via the registration page! Registration & pre-race events will take place at Otts on the Green. 15-30 minutes from the run, friends and family should head to Parking lots "F" and "G" in Washington Lake Park where the run will start promotly at 10am. The run will end at the Ampitheatre in Washington Lake Park. All post-run events, drinks and awards will take place at Ott's on the Green 20 minutes following the last runner finishing the course.